Stud fee of $700.00 USD includes a live foal guarantee. AI and live cover breeding available. Kembingur has been fondly known by his stable name of "Bruiser" from the day he was born, due to his impressive size for an Icelandic Horse, currently standing just under 14.3 hands. Bruiser is a lifetime resident of Meant To Be Farm. 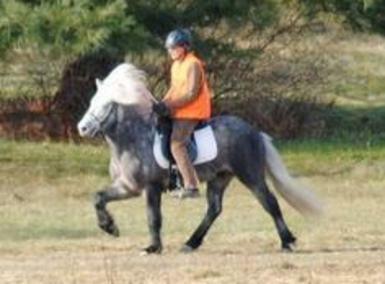 He is truly a very special horse and a great ambassador for the Icelandic Horse breed. Bruiser is a 5 gaited stallion, with an exceptional temperament to match his size & beauty, & he has proven to pass these traits on to his offspring. Further information regarding breeding to Kemibingur can be found on our AT STUD page.